Use the following pages to sign up for an operating slot or to see who is signed up at what time. Login with your callsign and the password will be sent to current members via email. 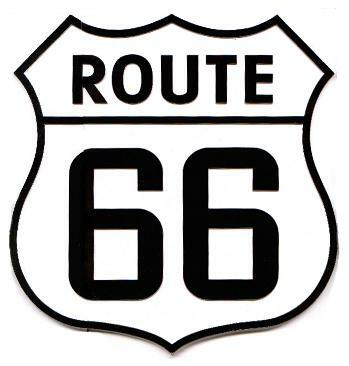 US Highway 66, established in 1926, was the first major improved highway to link Chicago with Los Angeles. Through stories, songs, and TV shows, the highway came to symbolize the spirit of freedom of the open road, inspiring many to see America. If you are old enough, when you listen to the sounds of the Nelson Riddle Orchestra you will visualize Todd and Buzz cruising down the highway toward another adventure in that sleek Corvette! The Citrus Belt ARC established this week long event, and have officially designated stations that operate along the route from Santa Monica, California to Chicago. Joplin has participated in this event annually since the beginning. The special event runs from Saturday, September 8th (0001Z) thru Sunday, September 16th (2359Z) 2018. Each year this event offers hams a fun way to relive their own memories of Route 66 and celebrate the highway’s anniversary. Amateur Radio clubs using 1×1 call signs operate from cities along the old highway route during the special event period in September. Joplin is assigned the callsign W6N for this event. The event coordinator for Joplin Missouri is Jim Johannes, NØZSQ. Contact Jim if you have questions. For event details, certificate information, QSL routes for all stations, and other general information, visit w6jbt.org, and click the link to ROUTE 66 On The Air. For Joplin, the QSL route is: JARC, PO Box 2983, Joplin, MO. 64803. It is important that you include a self addressed stamped envelope to cover the cost of return postage. JARC Net 2019-04-22 at 19:30 – 20:00 147.210 Mhz The weekly JARC net on the 147.210 (+) repeater (PL 91.5) is open to all area amateurs and usually lasts about 30 minutes. JARC Net 2019-04-29 at 19:30 – 20:00 147.210 Mhz The weekly JARC net on the 147.210 (+) repeater (PL 91.5) is open to all area amateurs and usually lasts about 30 minutes. JARC Net 2019-05-06 at 19:30 – 20:00 147.210 Mhz The weekly JARC net on the 147.210 (+) repeater (PL 91.5) is open to all area amateurs and usually lasts about 30 minutes. JARC Net 2019-05-13 at 19:30 – 20:00 147.210 Mhz The weekly JARC net on the 147.210 (+) repeater (PL 91.5) is open to all area amateurs and usually lasts about 30 minutes.